Our next Old Georgian excerpt comes from an episode in the story of Symeon the Stylite, § 21 (Garitte, CSCO 171-172, with text also available at TITUS here), two sentences reporting a fiendish onslaught by some devil-inspired beasts. 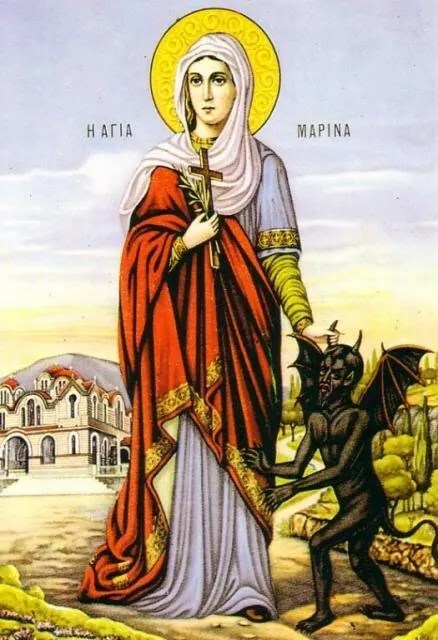 The saint known as Marina (Margaret in the west) — not to be confused with Marina the Monk — is in some churches celebrated on July 30. In the synaxaria available to me, I find her story only in the Gǝʿǝz for Hamle 23 (see PO 7:386-389, with a sälam). Her tale, quite fantastic, is known in many languages. Here is an outline of the version of the aforementioned Gǝʿǝz synaxarion, with some excerpts in that language. Her father, Decius (ዳኬዎስ፡), was a chief of the idol-priests (ሊቀ፡ገነውተ፡አማልክት፡ዘሀገረ፡አንጾኪያ፡), and with the saint’s mother dead, he gave her over to the care of a nurse or guardian (ሐፃኒት፡), who was a Christian and who taught her the faith (ወመሐረታ፡ሃይማኖተ፡ክርስቶስ፡). One day, inspired by hearing about the martyrs (ሰምዓት፡እንዘ፡ትትናገር፡ሐፃኒታ፡ጻማ፡ተጋድሎቶሙ፡ለሰማዕታት፡), the young saint, then around fifteen years old, went out to seek martyrdom herself (ሖረት፡እንዘ፡ተኃሥሥ፡ከዊነ፡ስምዕ፡). On meeting a “wicked magistrate” (፩መኰንን፡ዓላዊ፡), who characteristically inquires as to her identity, she equally characteristically responds, “I am of the people of Jesus Christ, and my name is Marina” (አነ፡እምሰብአ፡ኢየሱስ፡ክርስቶስ፡ወስምየ፡መሪና፡). The magistrate noticed Marina’s beauty and splendor (ስና፡ወላሕያ፡) and could not control himself (ስእነ፡ተዓግሦ፡), so he tried to persuade her with all kinds of talk to make her agree to give herself to him (ወሄጣ፡ብኵሉ፡ነገር፡ከመ፡ኦሆ፡ትብሎ፡), but she would not, of course, and instead she cursed him and slandered his gods (ረገመቶ፡ወፀረፈት፡አማልክቲሁ፡). This results in the magistrate’s command that she be beaten with iron bars, cut and lacerated (አዘዘ፡ይቅሥፍዋ፡በአብትረ፡ሐፂን፡ወይምትሩ፡መለያልዪሃ፡ወይሥትሩ፡ሥጋሃ፡) “until her blood flowed like water” (እስከ፡ውኅዘ፡ደማ፡ከመ፡ማይ፡). The saint prays and Michael the archangel heals her (ፈወሳ፡), but she is then thrown into prison, an especially dark one (ቤተ፡ሞቅሕ፡ዘምሉእ፡ጽልመት፡). There she again prays, Michael comes and illumines the prison, and he takes her to heaven and before returning her he shows her the habitation of the saints and the just (ወአዕረጋ፡ውስተ፡ሰማይ፡ወአርአያ፡ማኅደረ፡ቅዱሳን፡ወጻድቃን፡). Once, while she is praying, having endured more tortures and having received subsequent archangelic healing, a huge serpent (or dragon) comes to her “from one of the corners of the prison” (መጽአ፡ኀቤሃ፡እማእዘንተ፡ቤተ፡ሞቅሕ፡ዐቢይ፡ተመን፡). She is afraid of it, and it swallows her whole as she has her arms extended in prayer in the shape of a cross (ወውኅጣ፡እንዘ፡ስፉሕ፡እደዊሃ፡በአምሳለ፡መስቀል፡ወትጼሊ፡በልባ፡)! Just then, the serpent’s belly splits open, and the saint emerges unharmed (ተሠጥቀ፡ከርሡ፡ወወፅአት፡እምኔሁ፡ዘእንበለ፡ሙስና፡)! On her way back through the prison in another direction, she sees Satan sitting down in the form of a black man (በአምሳለ፡ብእሲ፡ጸሊም፡), his hands gripping the top of his knees (ወጽቡጣት፡እደዊሂ፡ዲበ፡አብራኪሁ፡); she marks him with the sign of the cross, grabs him by the hair and beats him with some kind of scourge (አኃዘቶ፡በሥዕርተ፡ርእሱ፡ወዘበጠቶ፡በበትረ፡መቅሠፍት፡)! After that, in a vision of the cross with a talking white dove on it (ተከሥተ፡ላቲ፡ዕፀ፡መስቀሉ፡ለኢየሱስ፡ክርስቶስ፨ወዲቤሁ፡ትነብር፡ርግብ፡ፀዓዳ፡), she knows her time of departure is near. The next day, the magistrate orders her stripped (አዘዘ፡መኰንን፡ያዕርቅዋ፡ልብሰ፡), hung upside down (ወይስቅልዋ፡ቍልቍሊተ፡), burned (ወያውዕይዋ፡በእሳት፡), and thrown into a cauldron of boiling liquid (ወይደይዋ፡ውስተ፡ጽሕርት፡ዘቦቱ፡ማይ፡ፍሉሕ፡). As she is praying inside the cauldron, a dove with a golden crown in its mouth comes and frees her bonds and baptizes her in the name of the Father, Son, and Holy Spirit, and the saint emerges from the liquid. The magistrate has had enough and orders her decapitated (ወአዘዘ፡ከመ፡ይምትሩ፡ርእሳ፡በሰይፍ፡), but before she dies, Jesus comes to her and promises (ወወሃባ፡ኪዳነ፡) that her name and story will have an especially effective intercessory power. So much for the tale of Saint Marina/Margaret. This fabulous (in the original sense of the word) story offers readers quite a spectacle of hagiography. We have several martyrological topoi, and students of Gǝʿǝz will find the excerpts, if not the whole, worth their time to pore over.